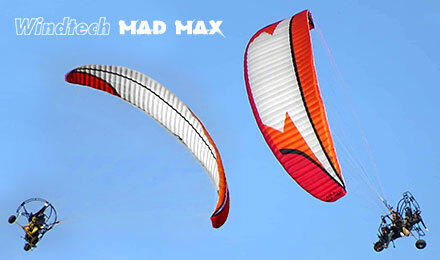 15-03-2019 > New Windtech Mad Max!!! Mad-Max: The first Windtech paraglider specially designed for trike and paramotor foot launch is born. It is able to carry a maximum load of 480kg and it is certified DGAC. it comes in 3 sizes: 36, 39 and 42 meters. Equipped with a full reflex profile and has an amazing cruising speed of 70km/h with trimmers open and has a very stable and comfortable flight behaviour. The inflation is quite good, very homogeneous, without any tendency to over-shoot and has a precise landing with very good restitution. Mad-Max will take you far away in your new adventures.